I've heard a ton about Barcelona and Spain as a great place for digital nomads to live, work remotely and travel, but honestly didn't think I'd like it as much as I did for a ton of reasons including the horror stories about pick pockets, and the siesta culture here. But now that I've been here for about a month I'm starting to really understand and enjoy the city. I just wish a guide like this has existed before I arrived as it would have saved me a ton of hassle, time, and money. Last year I visited a few coastal towns of Spain including Bilbao, Cadiz, Seville, Cartagena, and Palma de Mallorca, but Barcelona has been completely different. One of the first things you'll learn when you arrive here is that it's not Spain at all, but the capital of Catalonia. It's an autonomous community with their own culture, language, and cuisine. Forget everything you've heard or learned about Spain, including speaking Spanish as most of it doesn't apply here. This is the real Barcelona. Keep reading for the best location in the city to stay, where to eat, cowork, meet other digital nomads, what you should see, and what weekend trips you should defientely take. The good news is getting to Barcelona is pretty easy as it's a European hub. There are even direct flights from San Francisco (Oakland) and Los Angeles (LAX) for as little as $200 one way direct on budget airlines like Vueling, Level or Norwegian Air which is insanely cheap for a 12 hour flight. I don't know if I'd want to sit on a cramped Vueling flight for 12 hours with no TV screen, food or water, but I'd consider it and just bring my own stuff if the deal was good enough. Since I was coming from Bali, the best flight I could find was a Qatar Airways flight with a layover in Doha for $666. Luckily, I managed to use some of my own business class hacks to make the 30 hour journey manageable. Once you arrive in BCN it's actually super easy to get around. You can easily take the Airport Bus for $6 to the city center. When arriving, you can take either the A1 or A2 depending on if you arrive at Terminal 1 or 2, both go to the same stops in the city. Just make sure you get on the right one for your departing flight when you leave Barcelona. Not knowing any better and since we were arriving pretty late at night we took a taxi for $33 which, but in retrospect, knowing how easy the bus is, we would have just taken that since we lived a few blocks from one of the stops and even if we didn't it's still be cheaper to have taken the Airport Bus to the center than a taxi from there to our apartment. The biggest obstacle to staying in Barcelona is finding a place to stay and we had a super hard time doing it last minute, it was almost a nightmare. Looking for a place within 2 weeks during the beginning of summer in Barcelona was like searching for ice cold pina coladas in a desert. Airbnb only 3 out of 2,000 properties available and one of them was a camper van packed near the beach that still wanted $55 dollars a night. Finding accommodation in Barcelona should be on the top of your todo list and should be booked months in advance. Everywhere else in the world I've been to has been fine to book a week or two in advance but Barcelona is a headache for everyone. Crappy hotels in the city cost between $100-$200 a night and go up to $300 or more for a decent place. Airbnb is being cracked down on hard, but is still the best place to book online but since it's so popular everyone I met had horror stories trying to find a place for less than $100 a night that was somewhat central. If you're staying for a month or longer like we are, try finding accommodations in facebook groups like Barcelona Rentals as that's where we ultimately found our room. Speaking of which, I was happy to pay $1,000 up to $1,500 for private apartment for the month but couldn't find anything which meant we had to find a shared flat which is what most people end up doing. It's crazy that with how bad the economy in Spain is, housing is super expensive and hard to find. The biggest reason why it's difficult is that most reasonably priced apartments are only listed in Catalan and sometimes Spanish and often want a minimum of 1 year lease. The crazy thing is how many people still recomend Loquo.com as the place to find housing when it's been shut down since 2016. New sites like Idealista seem to be the alternative but after emailing 10 different owners, they all either got back saying they wanted a year minimum or didn't respond at all. You can also check out the new Co-Living space in Barcelona which is actually a pretty decent value and will get you on your feet the first month or two. The location is a 25 minute walk to the center and about 1/2 kilometer away from the closest metro, but overall not a bad location and the space itself is nice with a giant rooftop terrace. You can use coupon code "johnnyfd" to get a discount% off your stay or even free nights during the low season, simply by using my link above and having me refer you as an affiliate. If this place existed when I came to Barcelona I probably would have taken it as it would have been an easy way to meet other nomads, and since it's fully furnished and month to month, it would have been easier than trying to find a place on our own and still a bit cheaper than many places we found on AirBnb. So as a warning, if you want your own place make sure you book your place at least 1-2 months in advance when planning your trip to Barcelona. It's no where as nomad friendly as places like Chiang Mai where you can just show up and find a place the next day. In the next section, I'll explain where in Barcelona you should actually stay. It was actually really difficult to figure out where in Barcelona to stay, and honestly I think we got a bit lucky. If you search online, you'll see most places broken down by neighborhoods, but in actuality, what matters more is where you'll be staying in relative to the metros and plazas. The Gotic/Gothic/Gotico Quarter is the busiest tourist center which you'll want to be somewhere close to but not directly in. Ideally you'll want to like in El Borne but anywhere within a 25 minute walk that's close to a metro line is actually fine. Even though Barceloneta seems like it'll be a good place to live as it's right by the beach, it's actually pretty annoying to get in and out of as most of the Metros don't go there directly which means you'll have to transfer. It's much easier just to go the beach when you feel like it than to live there as there are far better beaches in Spain to go to over a weekend trip than the overly crowded one here in the city. But it is nice to have easy access, especially since there's an outdoor calisthenics/body weight gym to do pull ups on the beach. We ended up staying right by Plaza Espanya which even after a month of being here I can't figure out which neighborhood we're actually in as it borders Raval, Eiaxmple, and Sant Antoni. But that doesn't matter as when people ask you just say the plaza name and the important thing is that it's close to both the L1 and the L3 metro lines. Our place was was a 25 minute walk into the center which is about as far as I'd recomend being as anything further and you'll end up taking the bus and miss out on how nice it is to walk around the city, especially during the summer. It wasn't my number one choice in neighborhoods to stay in, but overall it was good. 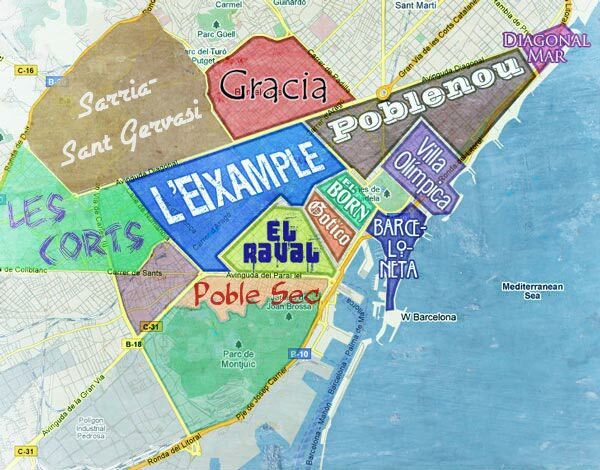 I'd also recomend staying anywhere in Eixample which would have been my top choice aside from being in El Borne. The only problem with staying in El Raval where I had to walk through everyday was that it was pretty boring as it felt more like a suburban neighborhood with a serious lack of good restaurants aside from the bar cafes that I'll talk about later. One of my favorite things about living in Barcelona is how easy it is to get around and how good the infrastructure is. The buses and metro are efficient and cheap if you get a 10 ride pass for 10 euros which I highly recomend as soon as you arrive. They are valid for both the bus and metros and can be passed to the person behind you to share the same ticket. Taxis around the city are 10 euro wherever you go and are available in abundance on the street. Because the public transport and the availability of reasonably priced Taxis are around, Barcelona is one of the few cities with a ban on Uber that doesn't really affect the ease of living as it's so easy to get around even without it. But even with the ease of getting around by public transport, I ended up walking to and from the center almost everyday as it's a breeze here. There are great sidewalks everywhere, very little traffic for such a big city, and amazing little bike paths and tree lined paths everywhere. I'm super impressed on how good the infrastructure is in Barcelona, and think it's actually better than both San Francisco and New York which is saying a lot. Compared to Bali where I just came from where getting around is literally a nightmare, waking up every morning in Barcelona and getting where I wanted to go has been super pleasant. Here I was able to travel double the distance in less than half the time and for 1/10th of the price than anywhere in Bali. Driving in Barcelona is actually super easy, with very little traffic, great roads, and easy to follow signs. I even stumbled upon a place called Formula GT where I got to drive a convertible Ferrari around the city for only 49 euros! This was super fun to drive around Barcelona! You'll defientely want a SIM card to get around, which you can pick up at the airport. But the line was so long and inefficient, we took the chance without one and picked one up in the mall the day after. For whatever reason Vodaphone was out so we went with Movistar instead for around the same price at $25 for 2GB for 4G of data only. Prices and data was similar to getting a SIM card in Berlin. Compared to other neighboring countries, including Portugal where you can get double that amount of data for half the price, or Poland where you can get 5X that for 1/3 of the price it defientely isn't a great value, but the connection was decent. The good news however is that there is free public wifi around the city and at most restaurants. The bad news is they force you to connect with facebook and checkin at every stop which means you'll have to log in and check into random restaurants each time you want to check your whatsapp messages which is annoying so getting a SIM card is defientely the way to go. As far as Wifi elsewhere, the good news is that Barcelona's infrastructure is there, it's just expensive so many places choose to use the annoying checkin hotspots instead of offering their own. We had blazing fast wifi at our apartment, and decent wifi at the cafe close by where I'd often work from. But at other places it was at a crawl sometimes. Overall, the wifi here in Barcelona is better than places like Bali but not as good as Chiang Mai or Poland and a lot more expensive and/or annoying. Working by the pool until it got too hot! I was super excited to eat Spanish food, Tapas, and Paella here in Barcelona, until I realized that I was in the wrong country, or at least region. Even though it's possible to find Spanish food here, the local cuisine is actually Catalan which is completely different. From what everyone told me, the food in Southern Spain is much better than Barcelona, especially since there's a tradition where you get tapas for free every time you order a drink, unfortunately it doesn't apply in Barcelona. Also since people here eat at super odd hours, if you wake up at 8am like I do and have dinner at 7pm, you're completely out of luck as most restaurants don't even start serving dinner until 8 or 9pm. The local cuisine during daylight seems to be cold sandwiches which actually aren't bad, but you just get tired of eating them after the seventh day in a row. The most common food seems to be cured meat/Jamon as you seem dried legs of pork hanging everywhere. Expect to have lunch around 2pm and dinner around 9pm. My favorite tapas restaurant was Bodega Biarritz 1881 which was a tiny hole in the wall with a ton of selection. My advice is to let the staff pick for you and to arrive early as there's always a wait. Also really good, and better for groups or people who want to take your time is El Pintxo de Petritxol which has cold tapas you can take from the bar and the ability to order hot dishes from the menu. Make sure you order the Broken Eggs with Jamon as it was one of the best things I ate my entire month in Barcelona. My favorite hole in the wall Catalan spot was called Pizzas l'Avia Restaurant even though I'm pretty sure no one ever goes there for their pizza. Their empanadas were the best I've had anywhere and their roasted potatoes and meat looks incredible. It was defientely the most authentic experience I had as everyone there was from the old neighborhood and still acted like they were in 1970. It looks a bit like an old hole in the wall but once you sit inside, you'll be glad you did as it has a nice feeling of being in your grandparent's dinner. The best breakfast spot I found is called Brunch n Cake which is known for it's instagram worthy presentations and lines out the door. My suggestion if you go is to order the pancakes either the matcha ones like we did or the banana/oat. Don't order the eggs unless you don't mind them cold, as but of the food meant to be served cold or room temperature tasted amazing and looked even better. But aside from a few good places, most restaurants in Barcelona are pretty bad. It's strange as people here love to eat and drink, but it seems like most people are okay with just mediocre, reheated, lukewarm food. The most popular dish patatas bravas which is potatoes in spicy sauce was amazing when roasted to a crisp and served with homemade sauce, but more often than not was often just crappy fried potatoes in prepackaged sauce. It really seemed like most people here were happy with having a cigarette, wine or beer, and whatever food was given to served, and not just the tourists but the locals as well. The good news however is the fresh fruit and vegetables in supermarkets are amazing here and very well priced making cooking at home a great option. Speaking with locals most people go out just to be social and end up cooking at home or eating at ethic restaurants whenever they actually want good food. One of my favorite places was a Peruvian restaurant called Mancora and a refillable falafel spot called Maoz Falafel which was incredible even though it's vegetarian. We also ended up ordering Indian food from the local delivery app, Deliveroo a few times too. Overall, Barcelona is a city with a ton of restaurants, a handful of amazing ones, but unfortunately, a ton of mediocre ones as well. Unlike Chiang Mai where can you just walk into any random restaurant and most likely get a very good meal, in Barcelona, make sure you do your research, look at the review and be willing to travel to get to some good eats. If you see a restaurant with slot machines in front, a pre-printed photo sign with paella, pizza, and pastas on it, don't eat there or you'll be disappointed as the food is usually frozen and heated up. Avoid generic restaurants with pre-printed signs. Eat at Authentic Tapas Restaurants instead. The good news is that there is some decent beer in Barcelona for great prices. Both wine and beer can be had for around $2 - $3 a glass in most restaurants with craft beers being a bit more expensive. The trick to ordering beer if you want a glass on tap and not a can or bottle is to simply order a Caña which literally means "cup" of beer, usually which ever is cheapest and on draft. You can also order a Copa which is a slightly larger cup, a Jarra which can either mean a jar or a pitcher depending on the context, or you can try your luck just saying Una Pinta which usually means one pint of beer. Buying beer in supermarkets will cost you less than $1. You can also order a Clara which is half beer and half lemon soda which is actually quite refreshing on a hot summer day. Here's a photo of what ordering a caña actually gets you. A Caña of beer. A draft 1/2 pint of Estrella. The Mahou Negra was my favorite. As for wine, the good news about Spain is that even the house or table wine is usually pretty decent and always a great price. The biggest downside of living in Thailand or Bali is that a drinkable bottle of wine starts at $25 or $30 at a supermarket, while in Spain you can get a equivalent bottle for just $5. Wine is a bit cheaper outside of Barcelona, just like everything else is and I've even heard that outside the city when you order wine with dinner, they refill your glass for no extra charge. If you really want to try the best wine in Barcelona, try going to either a wine pairing dinner or visit the vineyards just outside the city. We went on a 3 vineyard wine tour for about $70 which included transport, 7 glasses, paired with cheese and tapas which was perfect. We actually ended up ordering a few extra glasses at the second winery as we wanted to try a few different ones, but that defientely put us a bit over the top in drunkenness so I don't know if I'd recomend that. At the Jean Leon Vineyard. Aside from going to wine tours, eating and drinking in Barcelona, my favorite thing to do when you first arrive is to learn a bit about the history and culture. Whenever I go to a new capital in Europe, I always look for free walking tours and try to do them within the first few days when I land. Not only is it good exercise to walk around the city, but it's also a great way to notice things about buildings and sights that you wouldn't know on your own. I actually ended up going on three different ones and even though some of the spots were repeated, enough of the tour was different to make it worth going on more than one. Plus the guide, group, and day is different which always makes it a unique experience. The tours are free, just tip the guides $5-$10 at the end of it. You can find them at Sandeman's, Runner Beans, FWT Barcelona, or FeelFree. My suggestion is just to find the times that fit best with your schedule, and to go on two different Old Town/Gotic tours, and then one that takes you to see the outside of the Gaudi buildings. Another popular spot is Park Güell which features some of Gaudi's buildings. If you want to actually go inside, you'll have to book a spot at least a day or two before hand online. We arrived at 10am and the next available ticket wasn't until 4pm that day. But even without tickets, you can walk around the park, under the bridges, and to the front of the main building to take photos there which honestly is good enough for most people as the inside looks super touristy. One cool thing about Barcelona is that even the best museums are free every Sunday, but you have to book ahead as the free tickets actually sell out by the morning of. We tried going to the Picasso museum at 3pm right when it was scheduled to be free, but was told the free tickets were actually taken hours ago. Admission is free every Sunday from 3pm to 7pm, and the first Sunday of every month all day, as well as on a few random holidays. But either way, book your ticket ahead of time online. You don't need to print out your pass and you don't need to wait in line. Just walk straight in and present you ticket to any of the security guards. Don't waste your time waiting in what looks like the entrance line as most of those people are waiting in the wrong one anyways. Aside from the museums, visiting the buildings around Plaza Espanya is actually worth the visit. You can start by going up to the top floor of the actual plaza which used to be a bull fighting ring converted into a mall. Don't take the $3 elevator to the viewpoint as you can just go up to escalators in the mall for free to the exact same spot. After that walk towards the big museum on the top of the hill and you'll pass the Magic Fountain of Montjuïc which is actually worth visiting during the water show. I almost skipped it as I thought it would be something like I've already seen in Las Vegas at the Bellagio, but the one in Barcelona is actually 100X better. One of the best things about living in Barcelona is being close to both the seaside beaches in Barceloneta as well as having forests and mountains near by. Even if you show up with zero outdoor gear, you'll be happy to know that Barcelona has a three story Decathlon sports store where you can buy everything you need for less than $100. It's quickly become my favorite store as you can get high quality, comfortable clothes, boots and gear for dirt cheap. I bought a pair of Quechua hiking boots for $35 which I've now taken on two decently long hikes with zero pain, blisters or problems. I also bought a 40 liter backpack for the same price. Best of all, they have even cheaper options if you're on a tight budget with decent, usable gear starting at around $20. I bought a couple of quick dry t-shirts for $4 which I've been super happy with. your own food as even though there's a cafe there, they stop serving food and close their kitchens during their afternoon siesta period. The other cool thing about hiking Garrotxa is how varied both the terrain and animal life you'll see there. Overall it was one of the coolest hikes I've done and would highly recomend it as it's worth the effort to get out there. The second hike I went on, I actually led as I needed to go during a weekday and no one else was available since most people in Barcelona work normal 9-5 jobs. I chose to do the Montserrat hike as it was just a 1.5 hour journey by train from Barcelona. The hike we did started at the main cathedral, all the way up to the Sant Jeroni peak which was a beautiful 360 view of the country. To get to Montserrat, take the R5 train from the Plaza Espanya station. Buying the right ticket is a super confusing so make sure get there 15 minutes early to figure out the machine. You have the choice of buying a ticket for either the cable car ride up to the monastery which you would get off at Montserrat Aeri or the railroad track using the Cremallera funicular, which would you get off at Monistrol. We ended up double paying by booking the second option, but ended up needing to buy cable car tickets as on the way there we got off one stop too early, and on the way back we had just missed the train. My suggestion is to just book the cable car as since it leaves every 15 minutes, you have more flexibility with time and don't need to plan it out precisely. The hike itself from Montserrat to the Sant Jeroni peak was super well marked with signs so it's something you could easily do yourself without a group. It takes around 2 hours to reach the peak and 1.5 hours to get back down, so give yourself 4-5 hours total including a stop for lunch and for selfies the top. There's a small cafe and market at Montserrat so you could technically just show up and buy everything there, making it even easier. I've also met an older Canadian couple who stayed at the apartments in Montserrat as it was only 50 euro a night compared to 300 euros a night in Barcelona during the weekend. It would be an okay idea to do for a night and do the other hike around there if you wanted, but anything more than that and you'll be bored out of your mind living there. The hike here could be done in tennis shoes, just make sure you bring a hat and a minimum of 1.5 liters of water as it gets sunny at many points. Overall the hike was really good and only moderately difficult so it's something I'd recomend to anyone visiting Barcelona even if you don't have any hiking gear. Barcelona is becoming a destination for digital nomads for good reason, it's affordable, has good weather, good infrastructure and tons to do. Since it's part of the EU, a of of expats who are tired of cold winters in their home countries now live in Barcelona full time. There are also a ton of remote workers because of this which has allowed a ton of coworking spaces to open up. According to Coworker.com there are currently 67+ coworking spaces in the city. The best one as of 2017 is Cloud Coworking for it's terrance and giant windows which let in a ton of natural light. The day passes are super expensive at $22 a day, but the monthly memberships are reasonable at $187 which is less expensive than the coworking spaces in Bali and way better. A bunch of newer spaces have free day passes and some are half the price for a monthly membership, so make sure you check out more than just Cloud as you might find something you like even better for a lower price. Also check out Transforma BCN as they host a ton of events and nomad talks there, which is awesome, even though the space itself lacks natural lighting which makes it a no go for me to actually work from. While I was in Barcelona, I was invited to speak at the Nomad Talk hosted by Codino which is The Community of Digital Nomads Barcelona. Here's a full list of Barcelona coworking spaces for you to check out. Also join out the facebook group Barcelona Entrepreneurs and Digital Nomads for other meetups. You can also join the bigger Digital Nomads Spain group. Speaking of which, Meetup.com is super popular in Barcelona and unlike Chiang Mai where Facebook events is where everything happens, Meetup seems to be the go to here in Barcelona. Overall there seems to be a decent digital nomad and entrepreneur scene in Barcelona. It's not a place you can show up at and get instantly plugged in like you would in Chiang Mai, but if you plan on staying 1 month or longer, and make an effort to attend meetups you'll be sure to meet a circle of friends. Even though Barcelona is a good place to live if you want to find a 9-5 job or work remotely for a company long term, places like the Canary Islands or Lisbon, Portugal would probably be better for most digital nomads to meet other likeminded location independent entrepreneurs. One of the big reasons I didn't come to Barcelona sooner is the fact that I hate thieves and pickpockets more than anything and Barcelona has a terrible reputation for having a ton of them. What annoys me most is the fact that the Spanish government doesn't take it seriously and allows the criminals to just get by paying a $200 fine and continue their ways. At the height there were 600 reported thefts each and every single day during the summer, and an estimate that since 9 out of 10 people don't take the time to report it to the police and waste half a day to fill out a claim, that the actual number was close to 6,000 thefts per day which is insane! Aside from the normal scams like accidently spilling mustard on you, or wiping off bird poop from your shoulder while secretly robbing you, thieves started using razor blades or knifes to literally cut slits in your jeans so your wallet or phone would fall out. The good news however, is that even though it took the Spanish government years to actually do something as of recent, pick pockets are slowing down and it's less of a problem as it was before, partially thanks to more police presence, people being more aware, and people taking it into their own hands to hunt pickpockets down themselves. The biggest problem with pickpockets is that it usually ruins the victims vacation, causes long term identify theft and for some reason gets very little sympathy from people who hear about it unless it actually happens to them. I knew that if it ever happened to me I would probably be the one getting arrested for beating the crap out of the thief if I caught them. But luckily due to being cautious, and being extra cautious in crowded, touristy places, nothing happen to me during my month here. But I've met two girls who weren't as lucky. One had her bag snatched while she was walking, and another had her camera stolen right off her table while she was eating and having a conversation with a friend. I've also met a guy who's backpack was went through and all of his zippers were open while on the subway. My suggestions to stay safe is to never carry your passport with you, leave most of your bankcards at your hotel, check your pockets anytime someone bumps into you, and keep your hands on your pockets whenever walking through a crowded street. If you do get robbed, make sure you take the time to file a police report, and make sure you tell them you had more than 400 euros in cash in your wallet as anything less and they won't consider it a crime, even if all your ATM and credit cards were stolen. Thanks to people like Eliana Guerrero featured int he video below and increased police efforts, the problem is finally starting to slow down. I like it. It's a very livable city that's super easy to get around in with a ton to do. It feels like a cheaper, less crowded version of New York or a bigger more sprawled out version of San Francisco. It's surprising that the average salary in Barcelona is less than $1,500 yet things really aren't that cheap here especially not rent. Barcelona is one of those cities where it's common to have flatmates and eat at home for most meals verses Chiang Mai where almost everyone has their own place and almost every meal is eaten out. Most people here are super laid back, and the culture is one where it's normal to stay out past midnight for dinner, stay out for drinks every night, and spend most of your money without planning too much for the future. It doesn't feel to me like a hustler mentality, startup or entrepreneur crowd but is overall a good place to base yourself from when you want to relax, have a good time, and escape the European winters to somewhere still cold but a lot more mild. I can see why people live here, and could see myself living here comfortably for less than $2,000 a month, learning how to speak Spanish fluently, and having a normal life while having access to nature on weekends, lots to do in the city, and one of the best travel hubs for cheap flights around Europe and maybe even the rest of the world. Listen to Episode 162 of the Travel Like a Boss Podcast where I sit down with my friend Viktorija Juskevica to talk about what life is like in Barcelona compared to other places she's we've lived and traveled including New York, Bali and Chiang Mai. 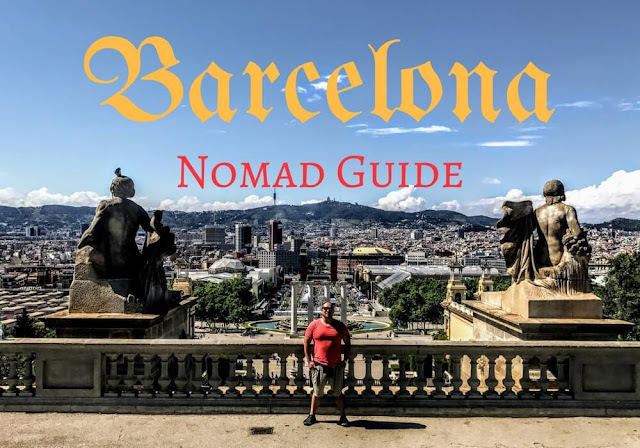 I hope you enjoyed this travel guide, it's been a fun month being in Barcelona and I plan on coming back for at least another week or so as I'm leaving my luggage here while I walk across Ireland. One of the the things I have on my bucket list is walking across Spain doing the Camino de Santiago so I'll defientely be back to Spain sometime in the future. Check out my travel guide to Chiang Mai, Thailand which was mentioned a few times in this post as well as my guide to Lisbon, Portugal which I think is a good alternative to Barcelona as it has a lot of the same upsides, but is a lot cheaper, has less crime, is less touristy, has more spoken English, and has access to an ocean instead of a sea. But at the end of the day, Barcelona is a great city to live in with a ton to offer and defientely worth visiting. Go cheap it out and decide for yourself where you want to live. The best thing about being location independent is being able to pick and choose where we base ourselves and for how long! P.S. Big thanks to Hana Kobzová and Lily Akhmetzyanova for the corrections and updates of this post! If anyone else is a local or a Barcelona expert, leave a comment below or message me to let me know if there's anything I missed. Thank you so much for your post, and podcast episode, it is the first one I’ve heard and I am gratefully surprised that you both have lived in Chiang Mai. Just before I got here (CM), I spent a couple of days in Barcelona with my sister and I liked it so much, and I agree that is so nice to walk almost everywhere and the architecture is just astounding. I will go back for sure and definitely do the hiking around like you recommend. I am from Chile, pulled the plug on my corporate job last December and actually got here only 5 days ago and I'll definitely be attending your events on Friday and hopefully be here for the next Nomad Summit. It is also so awesome that Viktorija Juskevica wants to go to South America and probably Chile next, so VJ if you need some help, I will be happy to help you with some travel planning. See you at the 2018 Nomad Summit! Great, I will check that one right now! eToro is the ultimate forex trading platform for beginner and pro traders.